This dress is shown in a double portrait in oils of Susanne and Ilse Gottschalk aged three and five, in 1933 (in the museum's collections). Their parents commissioned the artist Joseph Oppenheimer, RP (1876-1966) to paint it for their house in Berlin. Susanne is holding her teddy bear and Ilse is sitting by her toy poodle. 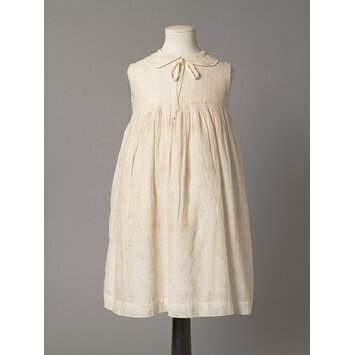 The toys have not survived, but the dresses have, which is relatively rare. The pale yellow dress is particularly typical of the period, and makes a strong contrast with the bolder colours and lines of the black dress. 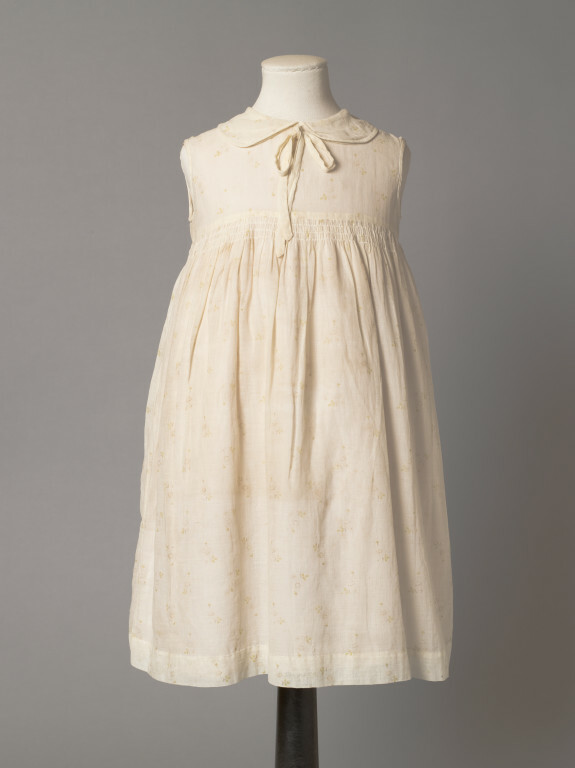 Girl's dress of unlined cotton muslin faded from pale yellow to a pale cream, and printed with a powdered leaf and flower motif in green and brown. The dress is high waisted and sleeveless, and has a round neck with a turn-down collar of self fabric trimmed with a rouleau bow of self fabric at the centre front. The skirt is gauged beneath the waistline, and the garment fastens at the back of the bodice with three metal press studs. Worn by Ilse Gottschalk to have her portrait painted by the artist Joseph Oppenheimer when she was aged five in 1933.